Best Chipset Platform, Amlogic Chipset, Android 6.0 MXQ TV Box with Wireless Mini Keyboard. Keyboard can make operation convenient. New Android 6.0 Marshmallow OS. Google Play store is pre-installed.It can load your favourite video, games, and many other app. It's integrated with powerful CPU and GPU. Amlogic S905X Quad core ARM Cortex-A53 CPU and Mali-450 penta-core GPU are way ahead in image processing and computing. Amlogic S905X is 64 Bit high cost-effective chip which will meet the current playback based on OTT applications, high performance, high integration, low power consumption, Higher performance will experience more entertainment. It's equipped with HDMI 2.0, 4 USB ports, optical interface and Ethernet interface which are readily available. LAN (ethernet) 10/100M, standard RJ-45 and WiFi RTL8189 802.11b/g/n guarantee the high speed. 4k2k H.265 Hardware Decode can save 50% bandwidth resources, let your 4k go super smoothly. 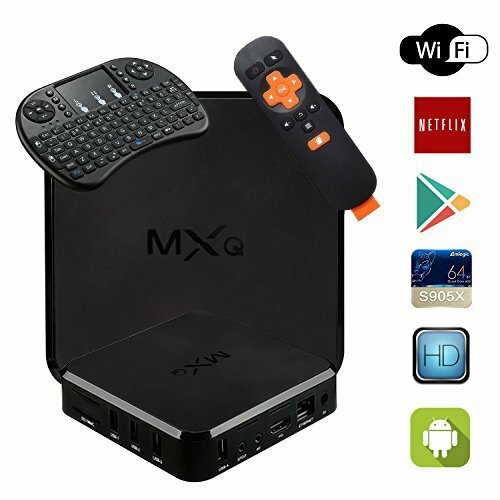 There're MXQ TV Box, remote control, HDMI cable, power adapter, user manual and mini keyboard inside the giftbox, but AAA batteries are not included. The mini keyboard works with 2xAAA batteries, non-rechargeable.1 year warranty for tv box and 6 months warranty for accessories. If you have any questions about this product by MXQ, contact us by completing and submitting the form below. If you are looking for a specif part number, please include it with your message.